Thanks to everyone that has purchased a wreath this year!! It makes me all warm and fuzzy to find all these stray vintage ornaments and breath new life into them. There is still one wreath left! Scroll down to the next post to find it. UPDATE - All wreaths sold! 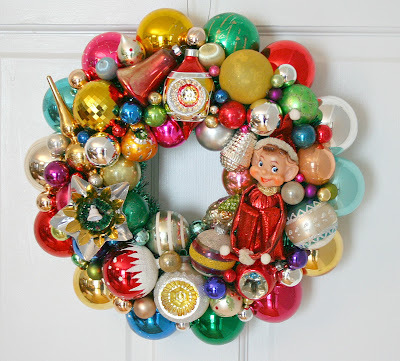 My friend Pam over at the most fabulous blog of all, Retro Renovation has acquired a special GeorgiaPeachez wreath. I stuffed this wreath full of Shiny Brites, reflectors and a shiny elf. Pam is most generously hosting a GIVEAWAY for this wreath!!!!! to leave Pam a comment and enter to win this wreath. Sadly, for some reason I couldn't leave my comment on Pam's blog. So I'm leaving it here so you can see it just for fun! everyone was blogging, except maybe the mouse. but we needed a wreath because the door was bare. we sprang from our couch to see what was the matter! but a blog giveaway for a wreath oh so dear! How generous, how sweet, how wonderfully festive! A fabulous giveway that is oh so impressive! I won! I won! Now my holiday is bright! Wowzers! My jaw is still hanging! These are so amazing and loaded with goodies!!! I linked over from another blog and was immediately rewarded with your beautiful work! Happy Holidays! I recently discovered your blog and adorable wreaths - love them both! You have a new follower for sure... Happy Holidays! I am happy Retro Renovation posted about your wreaths. The vintage ornaments bring back the sparkle of nostalgia. Happy Holidays! I want one of your wreaths! Oh my are they AMAZING! Will you be making more?